I look forward to the first Wednesday of each month in the school year, now known as PLUSS days. On these days, students arrive at 10:00 but teachers come in at 7:45. Teachers use the time to collaborate, discuss, and learn with and from each other. There is an expectation that people will use the time together to work on projects and issues that they would not otherwise have time to do. In a PK-12 school, this allows for cross-divisional work. It also facilitates interdisciplinary collaboration. The biggest challenge I have is deciding how to spend my time each month. There is a Google spreadsheet where anyone can add a conversation and everyone can see what options are available. An informal system has developed where the conversations are generally slated for one of the two hours, so that people can do more than one thing each time. The sustained, regular time throughout the year has meant moving forward on several fronts. I have worked with a small group of teachers to look at standards-based grading and issues related to grading, as we try to move to a more effective system for feedback and evaluation of students than our percentage based grades allow. The fact that we can meet once a month and talk about our trials, innovations and experiences has helped us move forward. Along with many colleagues, I have also used the time to work with our tech educator to learn some of the core apps we will be using next year when we become a 1:1 ipad school. We have lost one of our PLUSS day mornings this year to snow. I had to miss the most recent one to stay home with a sick child. I found myself missing the conversations, and even jealous of my colleagues when I was home and they were at school. I missed a conversation between English, history and science teachers about common standards and language for writing that I had been looking forward to. I did not get to hear about some colleagues’ latest work in standards based grading. This model works. I have done a lot of thinking about it, and I believe there are several reasons. First, we are treated like professionals who want to learn and collaborate, and we are given the freedom to decide what is best for us on any given day. The spreadsheet allows people who are unsure what they want to do or simply want to move out of their comfort zone to find a conversation to join. Also, the fact that this is regularly scheduled time allows for sustained conversation, with time for reflection or even trial in between. It enables teachers to plan ahead; English and history teachers can look for where their content intersects and meet at a point where they can plan for the convergence. Finally, it takes place in the morning when teachers are still fresh rather than during a faculty meeting at the end of the day. The concept is simple. Give teachers regular time to collaborate and then get out of their way. I am grateful to my administration for envisioning and implementing this. 9/11 – Was there a common story that united Americans? Iran Hostage Crisis – Did the students accomplish their goals? Navajo Code Talkers – Why would they volunteer for WWII when they had been treated so badly by the US government? Celebrity Diplomacy – What drives it? What impact does it have? US relations with Asia – How should the US deal with North Korea and its nuclear threat? How has cultural interaction been a part of the change in US relations with Japan since the end of WWII? Public Diplomacy – What is the effectiveness of strategies like divestment, specifically examining the case of South Africa under apartheid? 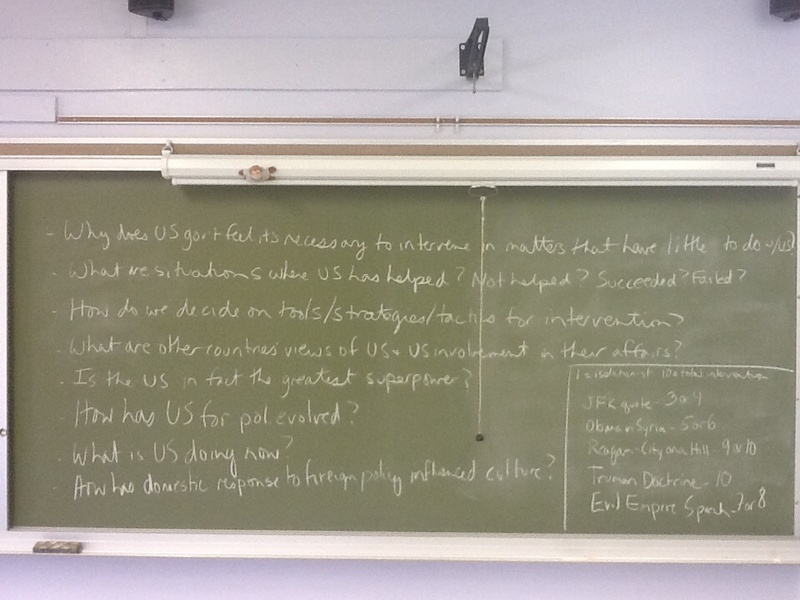 As the major focus in our US foreign policy unit, students chose a topic to research and share their findings with me and the class. In one section, these are the topics students have presented so far, and we are about halfway done. I had planned to be done, but between extensive presentations and follow-up questions from the class, we have several more to hear. A few students made movies, but many are relying on Power Point presentations. The medium seems to matter less than the expertise. I allowed students to do whatever they wanted for the presentation, and focused my attention on getting them to dig deeply and really own their topics. I have told the students that the work delivered by their classmates is as much a part of the curriculum as if I was presenting on it. This is going even better than I imagined. As I think about why the students’ work is so successful, I think it is a combination of things. They are very interested in the topics they chose. I stressed the need for them to become experts, pointing out that they need to know more about their topics than they plan to share. One student studying the Iran Hostage Crisis actually chose to write an essay. I asked him to share his findings briefly, and he ended up giving a twenty minute presentation. Also, the students created their own class rubric, which set high standards, but ones of their own design and agreement. They worked hard enough learning the information and what they think of it to exhibit confidence in their work, even though I know many were nervous. Finally, this class has developed a sense of community over the course of the year. There are many different personalities in the class, but they have taken my efforts to build a learning community seriously and have invested in the class. We we still have more presentations to go, but the quality of the discussion that has followed each presentation has been impressive. When we have completed all of the presentations, we will have a roundtable discussion that takes us back to the original essential questions about US foreign policy that the class generated in the beginning of January. Not everything works out as well in the classroom as it does in my head. But it can. Sometimes it is even better. EQs from beginning of unit.